Frame: 1983, locally made using Whitechapel frame castings. 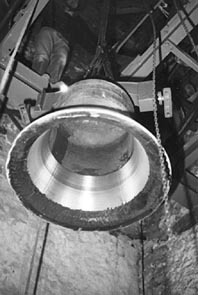 1420 Earliest bellframe known to be installed, probably for 4 bells. 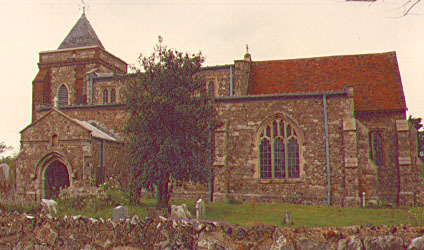 The tower was probably of timber construction with a spire. 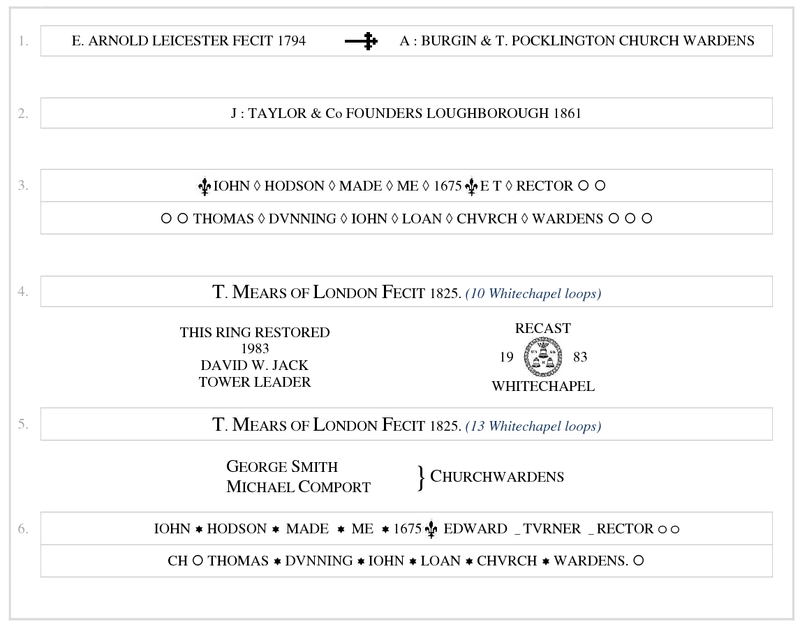 1675 Present 3rd and tenor cast. 1729 A bell was cast by Richard Phelps, 28 inches in diameter. 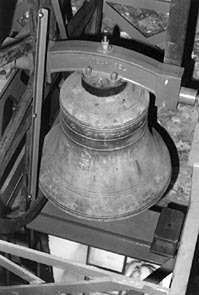 1788 The first peal was rung on the bells, being 42 "different 5 bell peals". The bells at this time were in the key of A flat minor. 1794 A bell was cast for St Luke's, Kinoulton, Notts. 1825 The tower was rebuilt in brick. Some portions of the old bellframe was used in the construction of the roof. A sub frame of the old frame supported a new "X" braced frame. The 4th and present 5th were recast by Thomas Mears. 1861 The 1729 Phelps bell was recast to form the present 2nd. 1983 Jan1 The bells, fittings, frame and the trusswork beneath were all dismantled. In January, the bells went to Whitechapel where the (then) treble, 2nd, 4th and tenor were tuned and the 3rd recast to place them in a major key. The canons were retained on the then 2nd and tenor. There was a row over the trusswork, and it was supposed to have gone to the (former) Medway heritage centre in St Mary the Virgin, Chatham. The bells were augmented to six with a bell reclaimed from the former ring of five at Kinoulton, Notts. This is the only Arnold of Leicester bell in Kent, and was tuned and fitted up by Whitechapel. In March, the frame having been assembled, R Offen & D Cawley hoisted & hung the bells with an army of local assistance in one day, starting at 9 am. finishing at 6 pm, when they were rung from the base of the tower with no floors between the ringers & the bells. The bells were dedicated in May. 1993 Whitechapel having produced a new type of canon-retaining headstock, the prototype was tried out on High Halstow tenor and, proving successful, was exchanged for the traditional one. 1998 The experimental headstock on the tenor having proved so successful, it was exchanged for a definitive one, and the old-style headstock of the third was similarly replaced. The 2nd bell hanging in its new pit. Hoisting the 5th. Both pics March 1983. 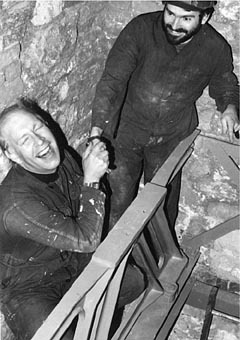 A touching picture of David Cawley and Richard Offen working in the belfry in 1983.